Overall view from street. The Collage House, Navi Mumbai, India. Architect: SP+S Architects , 2016. Photographed by Edmund Sumner, a house that uses recycled materials to suggest memories of the place: the project looks at the idea of recycling and collage in several ways, from the very physical – like materials, energy, etc. to the intangible – like history, space and memories. 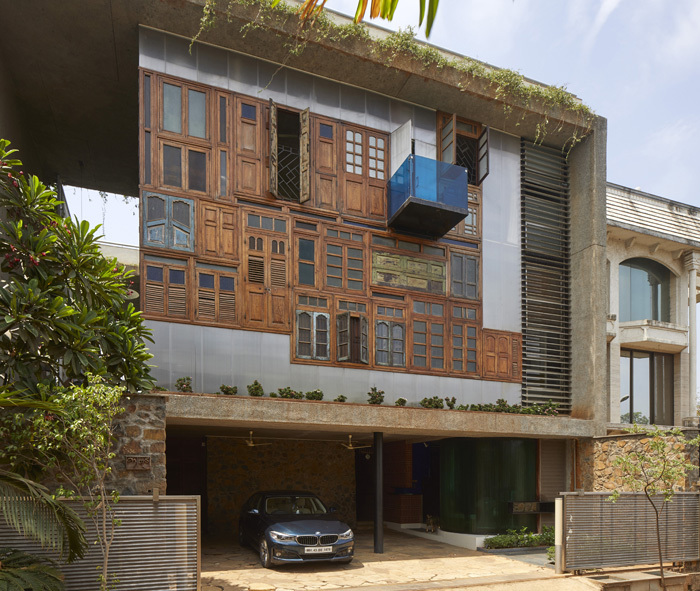 The front façade sets the tone for what lies within, with a “corner of windows” that recycles old windows and doors of demolished houses in the city. This becomes a major backdrop for the living room with an exposed concrete faceted ceiling above countered by the polished white marble with intricate brass inlay on the floor. Metal pipe leftovers pieced together like bamboo form a “pipe wall” integrating structural columns, rainwater downtake pipes and a sculpture of spouts that in the monsoon are a delight for all the senses.